Wooden doors look noble, aesthetically pleasing and elegant! No other door made of any other material can match them. Today it is possible to purchase a blank door for painting or varnishing. It is cheaper and more practical. 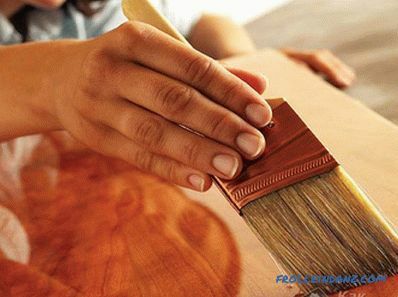 You will be able to varnish the product in the tone that best suits the interior. An even more economical option is to renovate a varnished door. Of course, you need to remove the old coating - to polish the surface, which takes time, but within your means this option will be much more economical. Lacquer has a transparent structure. This emphasizes the natural beauty of the tree. Even the budget door options, for example, made of pine, acquire a solid, expensive and high-quality appearance after varnishing. The tone of the doors, especially those that go in the same corridor, should be the same. This creates a solid picture of the interior. Although the interior door on the side of the room can be painted in any suitable interior tone of paint or varnish. 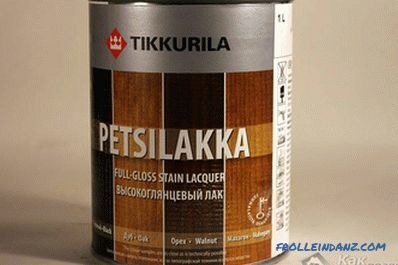 Varnishes on wood divided into several types. 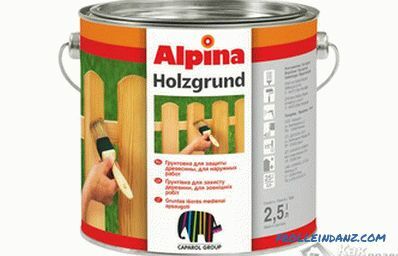 Alkyd varnishes have solvents in the base. They give the tree a yellowish tint, are waterproof. To speed up the drying process, improve moisture resistance and increase hardness, special hardeners can be added to the composition. Drying time is about 24 hours. Acrylic varnishes are made on the basis of water. They are odorless and non-toxic. To harden the coating can be added special hardeners, because this varnish itself is fragile. Nitrolacs have a significant advantage over their fellows - they dry quickly. Solvents are used as the basis. Nitrolak is very toxic, so their use is not always justified. Incidentally, when applying nitrolak best to use the spray gun. Polyurethane varnishes are strong. They differ in a dark shade and that is why the surface of the door is pre-primed. Of course, there are a lot more varnishes on wood, but they are usually not used at home. All types of varnish have one peculiarity - the more toxic they are, the better their consumer characteristics. Whatever your choice, painting the surface of the door with lacquer is basically no difference. It is more important to understand how to properly prepare the door for varnishing. 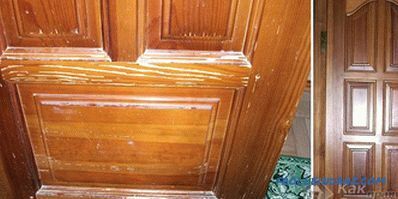 If you have to varnish the old one the door, you must first remove the layer of old paint or varnish. Although with good preservation of varnish, it is sometimes allowed to apply a new coating on the old varnish. To remove the old coating using sandpaper and construction dryer. If the doors are covered with paint, they can be cleaned with a special remover. Before varnishing such actions are not recommended. The fact is that the wash can be absorbed into the wood and affect its color. Because of how well the old coating layer will be removed from the door, its final appearance depends. This means that it is better to clean the door of the old paint carefully, avoiding damage to the surface. If you have to apply varnish on a new door, then you should first grind all the irregularities. 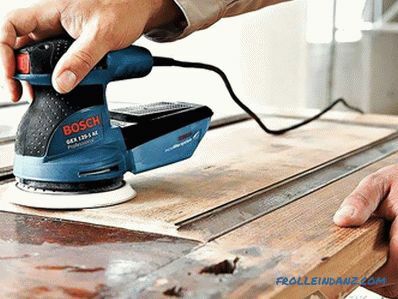 Often for this purpose, sanding paper is used, wrapped around a board measuring 25 * 10 cm. Grinding is a crucial stage, so it should be carried out with all care, although it will take a lot of time. The sandpaper abrasive fraction is 60-180, and it all depends on how uneven the surface is. For this purpose, a grinding machine can be used, which will only speed up the process. With the help of putty, corresponding to the color of the wood, cracks and holes are eliminated. A selection of color putty is important - because of this will depend on the final appearance of the door. 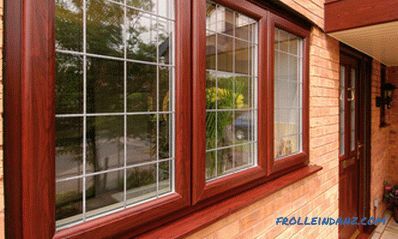 A special impregnation is applied to the door, which protects the wood from bark and mildew. 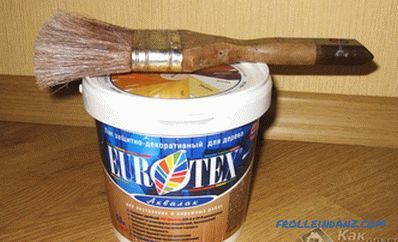 A primer is used to increase the quality of lacquering and reduce its consumption. It is applied with a roller or brush. Impregnation, primer and varnish should have the same base. Otherwise, due to incompatibility of the components, the coating will exfoliate. You can eliminate the problem by buying impregnation, primer and varnish from one company. After priming, the door is re-polished either with sandpaper No. 180 or a grinder. This will remove the remaining bumps. Grinding points are re-primed. If the varnish does not greatly change the color of the tree, they can replace the primer. However, the composition is pre-diluted. After opening the jar with the composition, slowly slowly stir it before covering the door with varnish. This condition is important, because only with slow stirring no air bubbles are formed. Pour a small amount of the composition into the bath, having previously fixed the door horizontally. With the frame, of course, everything is more complicated, which is why when it is painted, the drips just skins. For transitions between layers to be invisible, it is important to apply varnish quickly. The layers are applied in an overlap direction and must be at least 3. 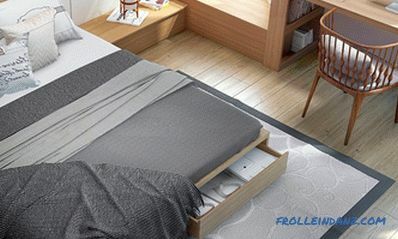 Before proceeding to the application of the next layer, you must make sure that the previous layer is completely dry. Varnishes have a different drying speed, so read the instructions to find out how quickly the composition you bought dries. As for the panels, they are usually lacquered with a small-sized brush. The drips, flows and streaks are removed with sandpaper, with the exception of the upper layer. While the varnish dries, the roller or brush can be stored in a can of varnish or tightly wrapped package. 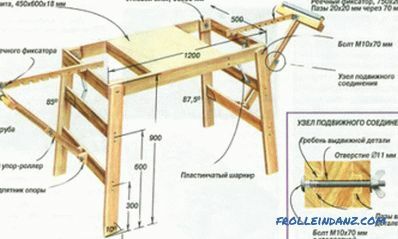 When varnishing, many craftsmen do not remove the handles, but simply wrap them, although this action is incorrect. This results from the fact that places under handles also need to be covered with impregnation and a primer. So, if you stick to the above simple tips, the door lacquering will pass without difficulty and in a short time. Perhaps you have questions on the topic or some notes to the article. We are waiting for your comments.